See also: Amadas and Barlowe Expedition; De Soto Expedition; Lederer Expedition; Lost Colony; Pardo Expeditions; Roanoke Voyages; Verrazano Expedition. The exact identity of the first European to make landfall along the coast of present-day North Carolina is a matter of much speculation and debate. Some historians maintain that various navigators in classical antiquity visited North America, but there is no tangible proof that they set foot in North Carolina. Others make the case that Norsemen passed through the area, citing among other reasons the similarity of eleventh-century Norse descriptions of Vinland and its grapes and Englishman Arthur Barlowe's sixteenth-century accounts of the profusion of grapes growing wild along the Outer Banks. If any of these ancient mariners did in fact sail along the coast of North America, they would of necessity have been acquainted with the treacherous waters of the Carolina coast. Explorers such as Giovanni Caboto (John Cabot) and Amerigo Vespucci are reputed to have coasted along the southeastern seaboard of North America, but, as in the case of earlier navigators, there is no proof that these voyagers went as far south as the North Carolina coast. The Cantino map of 1503 is thought to contain a representation of the eastern coastline of North America with many landmarks given Portuguese names. The name of the explorer who gathered this information and the exact date and nature of his voyage are unknown. Many scholars believe that the map does not even represent North America but is instead a chart of a small section of the Yucatan Peninsula misplaced by a careless cartographer. The first documented exploration of the North Carolina coast may have been a Spanish expedition hunting for slaves along the coast stretching from modern Georgia to North Carolina. Two boats made up this expedition, one ship commanded by Pedro de Quejo, another by Francisco Gordillo. Both men were slavers, the latter employed by Lucas Vasquez de Ayllon. Gordillo received directions on how to reach the land north of the Bahamas from Pedro de Salazar, who had apparently gained firsthand knowledge of the coast from a slave raid he had conducted about 1514. Whether Salazar had raided as far north as the present North Carolina coast is unknown. The Spaniards landed somewhere along the coast of an area the natives called "Chicora" in June 1521. The exact location of the landing site is uncertain, but some historians place it on the present coast of South Carolina. The first European expedition that is known beyond any doubt to have explored the coast of modern North Carolina was led by Florentine navigator Giovanni da Verrazano. Sailing in the employ of France, Verrazano sighted land near Cape Fear on 21 Mar. 1524. After a cursory examination of the coast to the south, he and his men returned to Cape Fear, where they finally went ashore. Verrazano believed that the Outer Banks was all that separated the Atlantic Ocean from a branch of the Pacific, and a passage through this sandy barrier would thus provide a new route to the riches of the Orient. For years afterward, this "isthmus" appeared on maps of the North American coastline. Verrazano's men put back to sea and continued north, landing along the North Carolina coast two more times. In 1526 Ayllon personally led a colony of 500 people to a place they called the "Rio Jordan." The exact location of Rio Jordan has been much debated; some scholars place it on Cape Fear, others south of the cape on Winyah Bay. Wherever it was, the Spaniards remained there only long enough to build a ship to replace one that was wrecked at the entrance to this river. The colonists moved down the coast to what they expected would be a more suitable locale. 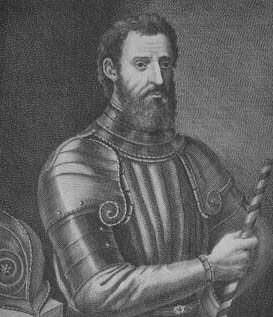 In May 1539 an expedition under noted conquistador Hernando De Soto dropped anchor in Tampa Bay to begin an extensive exploration of the interior regions of the land the Spaniards called "La Florida." De Soto's party, which originally consisted of 650 men, 12 priests, 300 pigs, bloodhounds, and various other beasts and equipage, spent four years exploring much of what later became the southeastern United States. During its second season in the field, the expedition traveled through the mountains of southwestern North Carolina. The explorers crossed the Little Tennessee River, gaining the distinction of being the first Europeans to cross a tributary of the Mississippi. They encountered, and often harshly treated, various Indian communities, including those that are believed to be the ancestors of the modern Cherokee tribe, but they failed to achieve one of their main objectives-finding gold. In August 1566 Domingo Fernandez sailed north for Chesapeake Bay with 20 men and some Dominican priests. The travelers experienced strong winds off the North Carolina coast and were forced to seek shelter at an inlet at 36° north latitude. The Spaniards sailed into Currituck Sound, landed, and planted a cross claiming the territory for Spain. They spent time exploring the Currituck Sound region before putting back to sea and resuming their original journey. Due to the strong winds, they never reached Chesapeake Bay. Also in 1566 a Spanish expedition under Capt. Juan Pardo marched north with 25 men from St. Helena Sound, in modern South Carolina. In the foothills of the Blue Ridge Mountains, Pardo built a fort, where he left Sgt. Hernando Moyano and a few of his men before returning to the coast for the winter. The following spring, Pardo returned to the fort, picked up his men, and continued northward, exploring the mountains of present-day North Carolina and Tennessee before heading in a roundabout fashion back to St. Helena Sound. Slafter, Edmund F., Beamish, North Ludlow Beamish, and Carl Christian Rafn. Voyages of the Northmen to America. Including extracts from Icelandic sagas relating to western voyages by Northmen in the tenth and eleventh centuries, in an English translation by North Ludlow Beamish; with a synopsis of the historical evidence and the opinion of Professor Rafn as to the places visited by the Scandinavians on the coast of America. Boston: Princ Society,1877. http://archive.org/details/voyagesofnorthme00slafiala (accessed February 1, 2019). Our Georgia History. "Conquest of the Land" Golden Ink. http://www.ourgeorgiahistory.com/early/conquest_of_the_land.html (accessed February 1, 2019). Rowland, Lawrence Sanders, Alexander Moore, and George C. Rogers. The History of Beaufort County, South Carolina: 1514-1861. Columbia: University of South Carolina Press, 1996. Giovanni da Verrrazano, an early North Carolina explorer. Image courtesy of Learn NC. Available from http://www.learnnc.org/lp/multimedia/6870 (accessed August 20, 2012).